At the 2014 NWP Annual Meeting, a group of us participated in a “messing around and geeking out” session on Playing with Open Designs for Professional Learning. The idea of this session was to think about how connected learning meets professional learning through open play experiences. 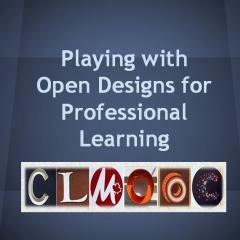 We looked at how two summer’s worth of experiences in the Making Learning Connected (CLMOOC) and how it was like a giant online professional learning “sandbox” where we could prototype and collaboratively design ways to connect learning for ourselves, as adults, and the youth with whom we work. Then we spent most of the time exploring what that kind of learning experience might look like in everyone’s own learning and teaching contexts.